If you are looking for picturesque backdrop, stunning landscape and a fun wedding, look no further then the beautiful Canadian Rockies. It covers all of the above and more. 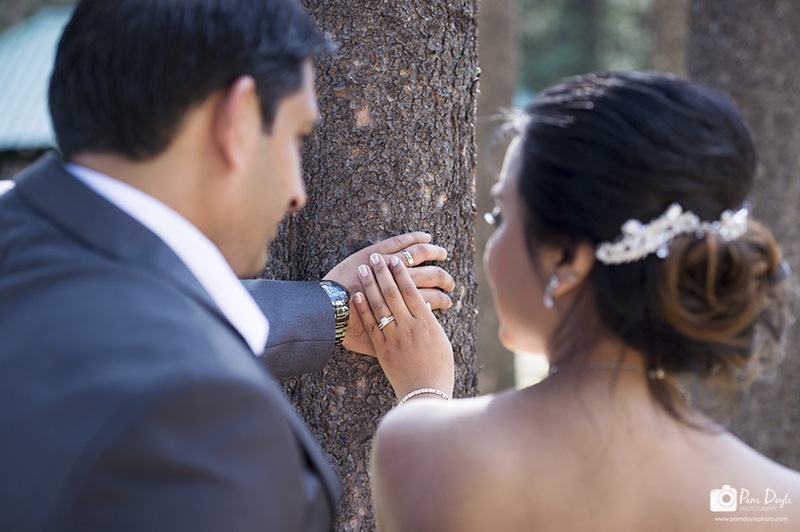 Salil and I said “I do”, in Banff and the destination was a dream come true. 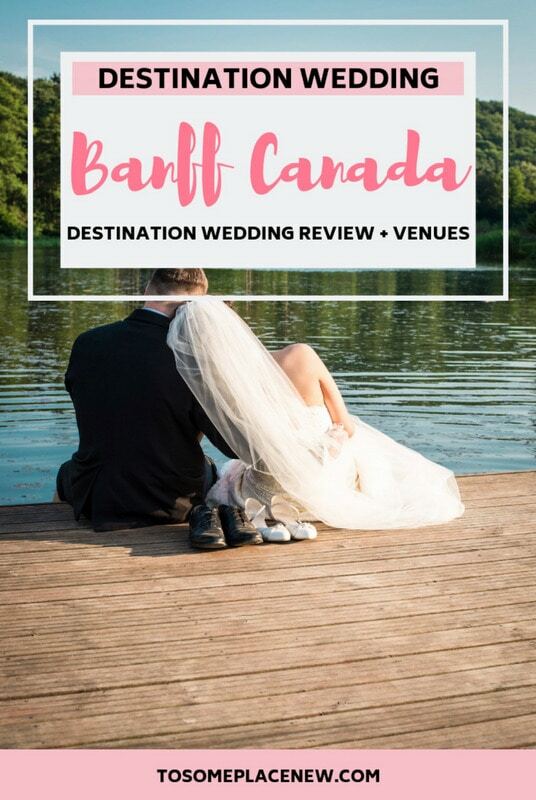 In this Banff Destination wedding guide we have summarized our little ceremony (and review) and included information on how to arrange for vendors and legal formalities of wedding and budget. 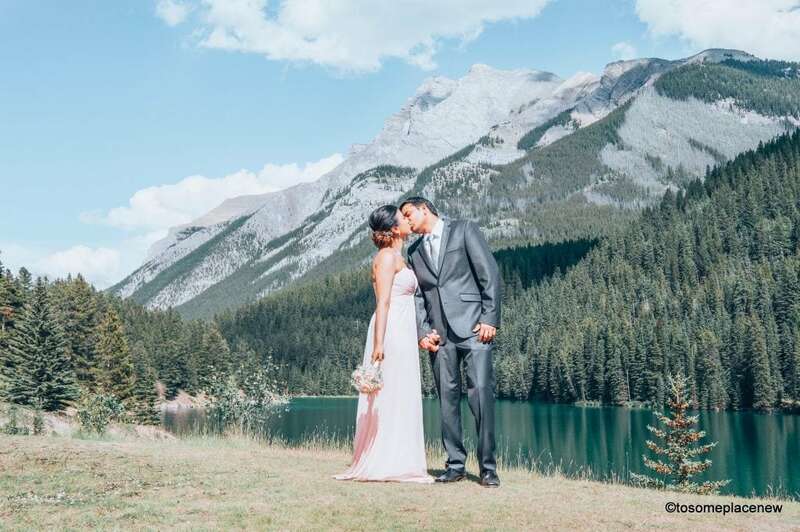 This post also includes Banff Wedding Venues for you to consider – for elopement or grand weddings, indoors or outdoors. Also, we share our story – why we chose Banff as our wedding destination. Continue reading to find out more! Personally we both love Banff and enjoy spending time in the mountains. Banff was our first vacation together as a couple. We visited Banff in 2011 and married in 2016. Both my husband and I hold Indian passports and are Canadian Permanent Residents and getting a marriage licence here was easy. Our wedding ceremony was a top a small hill on 2 Jack Lake. We were officiated in a civil ceremony. We kept the wedding simple and true to our selves. You can customize your ceremony and venue setting just the way you want. There are options to bring in props or set up seating for a limited number of people by lake-side or mountain valley or garden. You can get married in civil or religious ceremony. 2 witnesses are required to sign the marriage document. You will be issued a statement of marriage, once its officiated. After the wedding, you will have to apply for a marriage certificate. Getting hold of wedding vendors are easy in Banff. There are packages available by wedding planners or you can approach hotels who specializes in weddings and related venues. Hotel- Wedding Packages – Hotel companies like Rocky Mountain Chain, Fairmont offers venue for weddings and parties. They can arrange for seating and food as per your needs. There are wedding consultants available at request as well. Some wedding packages also include photography and a “honey-moon suite” after. Find more information about lodges and hotels that offer wedding packages here. We wanted our wedding to be outdoors, by the lovely mountains. Our wedding planners were – Rocky Mountain Wedding Planners, who are based in Banff. They arranged for the officiant, photographer – Pam Doyle and a local salon for make-up. For our venue, we chose the Two Jack Lake. We also got 2 hours of photography done after in the nearby areas. We really had so much fun that day. All thanks to Rocky Mountain Wedding Planners. 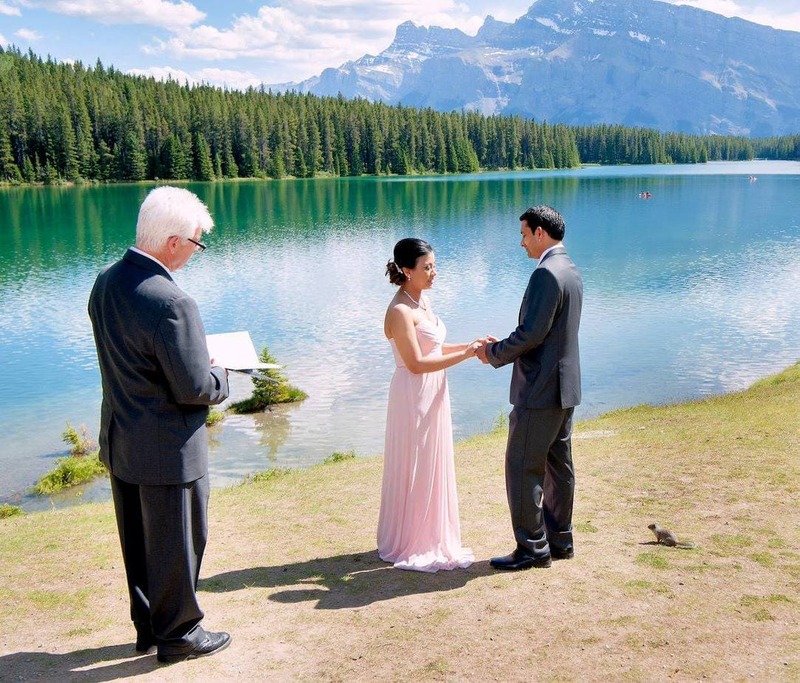 We do recommend doing an outdoor wedding, if you are choosing Banff as your destination. The reason we chose Banff was because of the mountains and blue turquoise rivers as our back drop. Elopement or couples only wedding or small weddings are perfect for Banff’s outdoors. Moraine Lake – The MOST picturesque backdrop for outdoor weddings in Banff National Park is of Lake Moraine. The mountains and the lakes make for a stunning picture. This venue is suited for summers only, but keep in mind, there is driving time involved from Banff to Moraine Lake. Or another option is to stay at Moraine Lodge and get ready for the wedding ceremony the next day. Moraine Lake Lodge offers honeymoon packages as well along with wedding and pre-wedding options with photography. Two Jack Lake – Two Jack Lake is located in Banff and is a great option for an outdoor wedding too. This is where we got married, so it is extra special. The lake is busy during summers, but it NOT as crazy as Moraine Lake, so definitely put this on the list. Cascade Gardens – Yes you can get married at the Cascade Gardens. Cascade Gardens is a beautiful garden-park curated and maintained very close to Banff Downtown. You can say “I do” here with mountains and flowers in tow. There is a gazebo that can fit 10-15 people or if you are eloping this is perfect as well. Central Park Gazebo – Banff’s Central Park located along the Bow River is a peaceful park to enjoy nature. It has a gazebo (Louis Trono Gazebo) that can be booked for special events including weddings. Washroom facilities are available at the park. Tunnel Mountain Reservoir – The Tunnel Mountain Reservoir is located behind Buffalo Mountain Lodge and offers stunning views of the Canadian Rockies. This area can be reserved and booked per hour basis. For planning your Banff Destination Wedding, it is recommended that you connect with a local wedding planner, discuss your ideas and vision and pricing, of course. Wedding Planners that we talked to were very flexible and accommodating and we were provided with many outdoor options before zeroing down on the final ONE. They will also arrange for hair and make up, photography services as well as arranging documentation and officiant. If you are looking for BIG weddings or want something formal with food and dancing, then here are a few options for you. Rimrock Hotel – A 4 star hotel, located in Banff (also one of our favorites) offers wedding services (venue, ceremony and photography) in their events and conference hall. They can also accommodate drop-in visits. Rimrock Hotel wedding packages are quite detailed and can be customized. They offer both indoor and outdoor weddings – both intimate and gran weddings can be held here (up to 400 guests). Buffalo Mountain Lodge – Buffalo Mountain Lodge is a great option for weddings with less then 100 guests. The Lodge can provide accommodation for guests and wedding services on site. St Mary’s Parish – We witnessed many weddings here each time we are in Banff. Located in downtown Banff, St Mary’s Parish is great option for formal ceremony. The beautiful church is built in Romanesque style and dates back to the 1700’s. 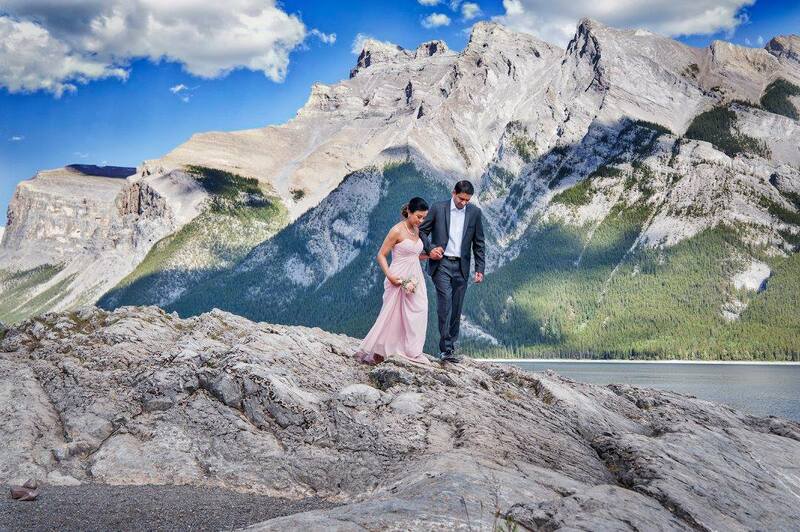 We did consider many destinations for our wedding and Banff definitely made to the TOP. We highly recommend Banff for your dream destination wedding. We were really happy with the arrangements and we loved it that it was a simple ceremony – filled with love and promises for our future together.